don’t rush it; for maximum stability, it needs to be assembled correctly which means following the directions to the tee! get it level; place a level on the top of the unit and use shims if needed underneath. Just know sometimes you have to go with what looks better to the eye than to what is actually level. get it on the wall; once level, mount it to the wall for maximum stability. 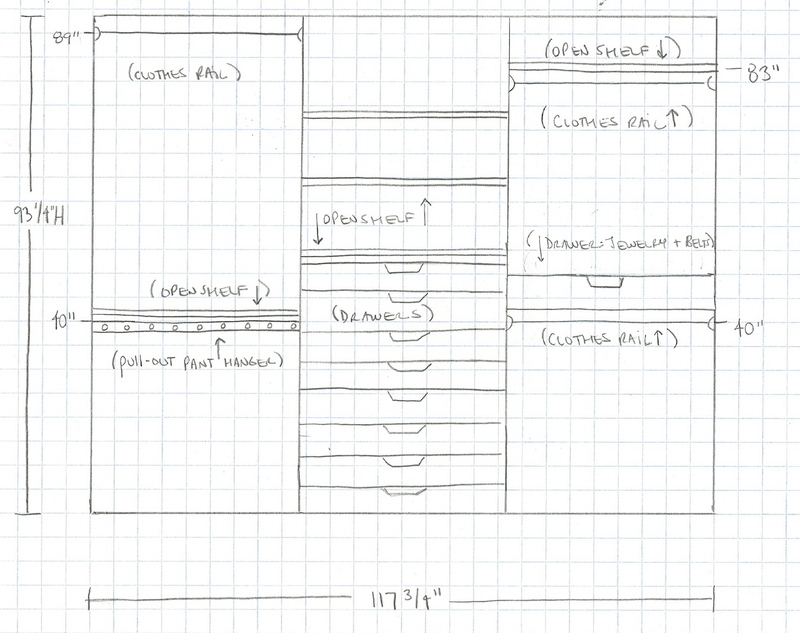 planning is key; figure what you’re going to store in it beforehand not after. group like-things together; all pajamas, all workout, all t-shirts, all pants, or all work pants and then casual pants; whatever makes the most sense to you and your lifestyle. drawer it out; especially when using the deep wardrobes, go with drawers from the bottom, going as high up as is comfortable for you. install one drawer at a time from the bottom up making sure you don’t waste any space; and if you’re doing shelves, install the shelf, put what you’re going to put on it so you can place the next shelf up exactly where it should be so you aren’t loosing as much as an inch of space. In addition to the images above, check out Nicole Balch’s original post for more shots on her blog MakingItLovely.com. And Lonny magazine’s current issue (issue 3 feb/march 2010, page 21) has a great article showcasing Pax wardrobes for even more great ideas and gorgeous shots of Pax in action. If you like, send me some pics of what you’ve come up. Thanks for reading and thanks for the great question Leah! We have Pax closets and absolutely love them. I love all the options, which make it so easy to customize things for your own needs. I've found the quality to be great too, much more stable and long-lasting than some other Ikea pieces. Thank you SOO much!! This is wonderful! I will definitely send you photos once it is complete (probably won't be for at least 3-5 weeks). Thank you again! Hi Laura! MAN, these things take a while to put together. We spent all day yesterday building both wardrobes. Question for you and your readers: (1) I did not realize handles do not come with the doors (I have the white Pax Bergsbo doors in the largest size) … whoops! There doesn't seem to be an easy way to open the doors without handles – am I missing something? How easy is it to add handles? (2) Is it a bad idea to add hooks to the insides of the doors (using the kind that stick on, not nail in) to hang things like belts and necklaces? Thanks so much for your help! Leah: yeah, they should make it clear that you need to buy the handles separately. installing isn't too bad but takes a little careful timing as they need to be drilled into the doors. You want to install them AFTER the piece is level and connected to the wall. As far as hooks on the inside, there isn't much clearance to hang things inside the unit. You don't want anything getting snagged. I would suggest putting hooks on the inner sides and outside. Anyone else have any suggestions? Has anyone tried to use different drawers than the ones from Ikea? I am not a fan of the way the drawers are somewhat open at the top.Besides that, I love the Pax system, I would like to try installing different drawers though. joe, i've never tried using different drawers. they would have to be exactly the right size….